Have you ever wondered why you hit a certain point when you felt you couldn’t continue, or didn’t know how to proceed with the art you are creating? David Bayles and Ted Orland explore the reasons or excuses numerous artists employ that delays their career as an artist. In the introduction, they begin by removing a reason artists fear revealing their creations. People believe they shouldn’t recognize their art unless it is deemed worthy of being acknowledged, or if others label it as art. However, the authors write, “Making art is a common and intimately human activity, filled with all the perils (and rewards) that accompany any worthwhile effort. …This, then, is a book for the rest of us.” The authors refer to any art constructed by those who are not widely known as “ordinary art”. It is important to keep in mind that several people in the world are thinking to themselves as well that in order for them to call themselves artists they need to get on the same level of recognition as Mozart or Bach. However, the truth is, those kinds of people only come along every once in a blue moon. So, until another genius comes along, I say we continue making our “ordinary art”. 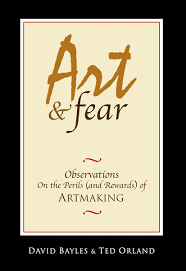 Throughout the book, Bayles and Orland describe different lessons and fears that artists will experience. One of the various lessons the authors mention is, “One of the basic and difficult lessons every artist must learn is that even the failed pieces are essential.” I found this lesson to be interesting, because when I feel something I create is not worthy of attention I get rid of it. Except, Bayles and Orland say that by keeping the failed pieces allows you to learn in what areas you need to grow or change for future pieces of art. I never considered keeping pieces that I am disappointed in and keeping them around for future reference, but I understand how this lesson is valuable to an artist. Another quote that I personally connected past experiences to was, “Artists quit when they convince themselves that their next effort is already doomed to fail.” I constantly count myself out of the ring before the bell was even rung, because my latest creation didn’t turn out they way I had intended. One thing to keep in mind is that we are bound to fail a thousand times, and yet it only takes one success in order for you to have a masterpiece on your hands. Keep on failing, because you are making your way to your masterpiece. “By definition, whatever you have is exactly what you need to produce your best work,” Bayles and Orland wrote. Do not doubt your own capabilities or artistic expression, because those are what are going to help you create your future masterpiece. Doubt is a huge enemy of an artist, and it’s imperative that you have confidence in your skills and vision. I recommend this book to any artist who is struggling with producing work in which they have zero faith or hope. The authors connect well with their intended target audience, going to a place in which their readers are currently with their careers. They pinpoint experiences and fears that you as an artist will eventually go through. If you would like to experience the wisdom and insight that is revealed through these pages, you can purchase the book on Amazon here.